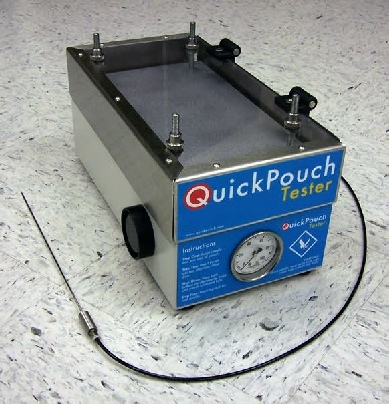 This test fixture is ideal for qualitative burst testing of pouches made by our pouch forming machines. The fixture enables a seal creep test which will test the integrity of the seal of pouches made by our form fill seal machines. A sealed bag is placed between the confirmation plates, and the bag is pressurized by inserting the needle through the surface of the bag. A 3/8” clear Lexan cover and dual push buttons minimize the chance of injury. Side door enables quick introduction of pouches into the test fixture without changing the adjustable confinement plates.